One Thousand and Four and Counting [1004 and counting], 2012, diptych 2 of 2. 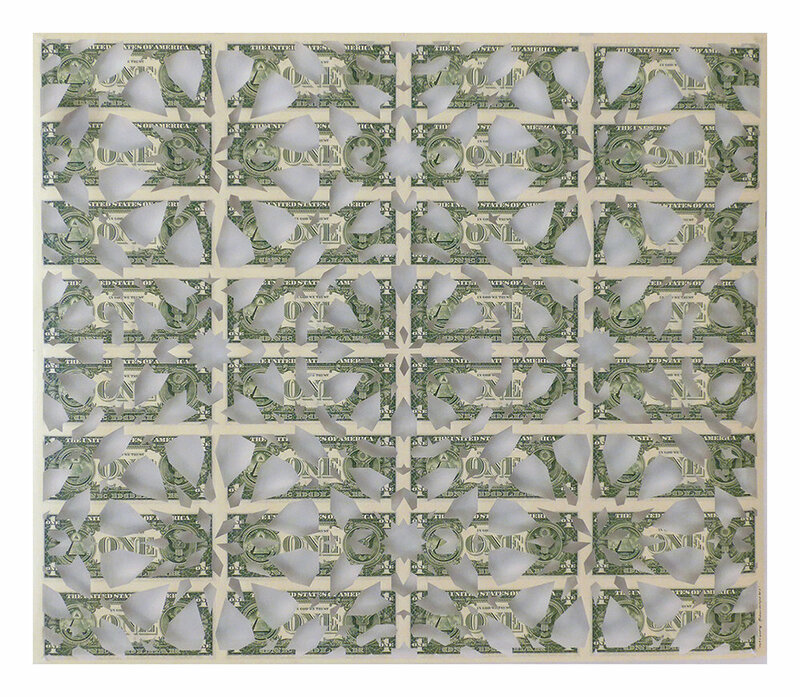 In One Thousand and One and counting series (2012 - ongoing) the uncut sheet of 32 US$bills is hand cut and transformed into two distinct views of ‘Capitalist’ geographies: one that reads as the Capatalistmap the Post 9/11 narrative of Islamic world from the outside and the other as the Islamic patterned tile Jali, a type of window screen use to separate private spaces from the public in Islamic countries like Pakistan. In this regard, money becomes a conceptual device not only to separate but also to measure Western capitalist ideas of ownership, economic power and notions of prosperity, which were once a hallmark of Islamic empires ranging from the Ottomans, Safavids to Mughals. Furthemore, The construction and subsequent deconstruction of currencies and their geometric and arabesque patterns allude to the fantastical flying rug of the Arabian tales that has become a flippant and all encompassing cliché for ‘exotic’ Arab/Islamic culture. 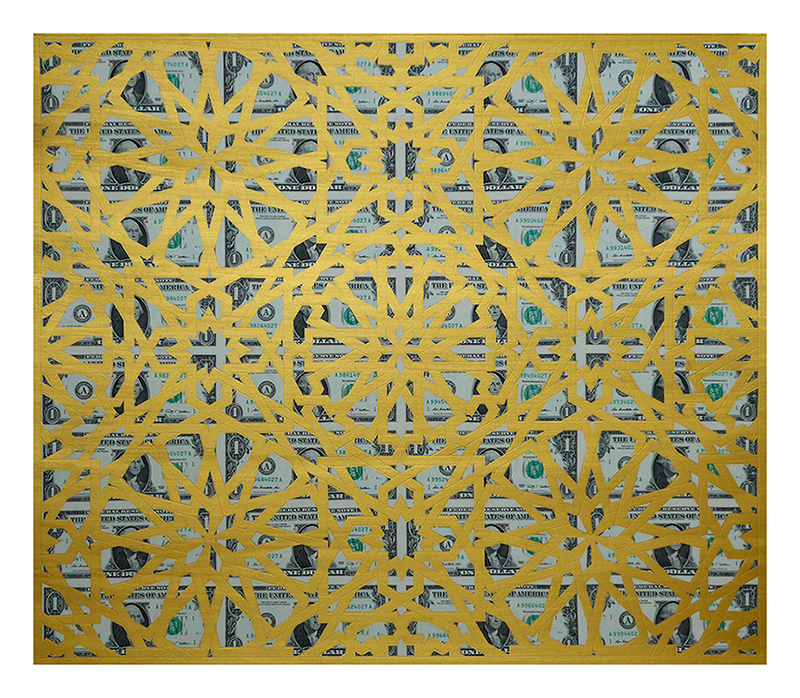 The debris emanating from the cutting of the uncut sheet of 32 bills are then glued onto gold-inked handmade paper, Vasli, to re-create the original pattern by filling the blank spaces (or in this case, the gold spaces) of the line drawing of the same pattern on paper. This art making process requires the same meticulous investment of craft and labour that is a hallmark of Islamic art and design and the dualities of East and West come to reside in a concurrent geography. They reside in liminal spaces that promote the discourses of Orientalism and Occidentalism, binaries that are redefining notions of hybrid identity, hybridity of cultures, and aspects of globalization including capitalism. They do this not so much by penetrating and possessing these discourses, but by encountering them, and in doing so, discovering the binarism of self and other. 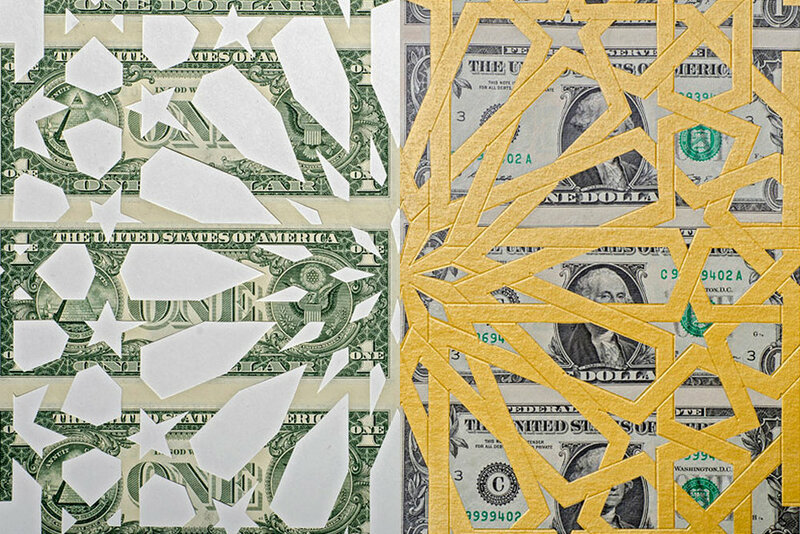 Lastly, The work seeks to subvert the imperialist Western hegemonic ideology of global capitalism through the construction and deconstruction of its chief currency, the US dollar bill. Its poetic materiality uses currency to make autonomous art, while ironically the work affirms the interdependency of art and economy, the commercialisation of art, and culturalisation of economy.